A few weeks ago, I commented on a LightReading article  on the topic of IoT prospects for wireless operators. I received positive feedback and a few questions about my observations on the revenue drivers that will shape operator strategies over the long run. In essence, I pointed out that wireless operators can grow in three directions and that their individual strategies will be a hybrid of the alternatives. Readers can digest the full logic of a presentation that oneM2M Partnership Project invited to deliver at a workshop hosted by ETSI  in December 2015. In summary, I outlined how operators can grow along three dimensions. 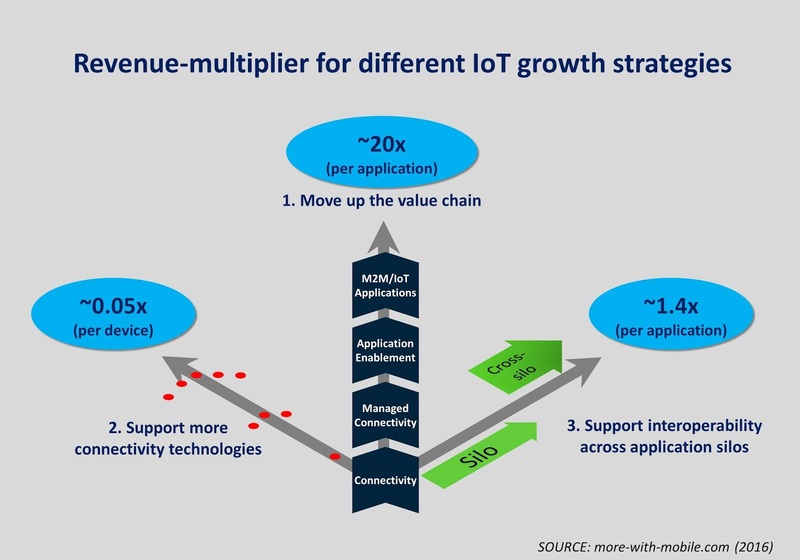 The observation that came as a surprise concerns my estimate of the per-device revenue gains from low-power IoT devices i.e. roughly one twentieth of the average mobile, connected device. This level of revenues severely dents the economics of traditional wireless operators and hardware vendors. If there is any doubt as to this conclusion, readers need look no further than the outcome of a recent, Wireless IoT Forum (WIoTF) members’ meeting . The WIoTF is a relatively new industry alliance that aims to promote low-power, wide-area communications for the Internet of Things. The opening speaker at December’s event, Mark Harrop (Business Development director at BT) urged the Forum to focus its efforts as strongly as possible on commercial imperatives, particularly the need for interoperability and platforms which can enable monetization in the near term. "Our initial remit remains the same – to drive consensus, based around real world operator requirements, in the fragmented world of low power, wide area (LPWA) wireless networks for the Internet of Things. However, that remit already involves an expanded range of challenges and activities. This means looking beyond the access protocols alone when devising the WIoTF’s work items and requirements, focusing on monetization, not just technology; and on every layer of the wireless IoT network, up to the applications". Will hardware vendors enter the platforms business with an own-build or a partnering strategy? Many MNOs currently partner with connected device platform service providers. How will mobile network operators deal with the additional risk of disintermediation as other companies move up the value chain? The issue for established platform-service providers is one of continued growth and the challenge of improving functionality, most likely by incorporating plug-in service specialists (e.g. application or segment-specific data analytics) and application developers. For enterprise users that are being swept up in by the Industrial Internet phenomenon, what are the time-to-market implications of in-house vs. third party platforms. And, what are the financial consequences of locking into proprietary vs. open-standards solutions? And finally, a question that applies to for all industry incumbents. Do they wish to create value organically or through acquisitions in an overcrowded market of platform service providers who are desperately seeking their (cash-out) exit strategies? There are ways out of these situations. They involve multi-stage strategies and a judicious placement of investments between fast-to-market and more enduring solutions that can handle the expected phases of IoT market evolution. Some useful data points on NB-IoT hardware and customer expectations. Deutsche Telekom has still not seen any big tenders for NB-IoT because module costs are far too high for its business customers, says Jens Olejak, the senior product manager at the German operator's M2M unit. Module prices need to fall closer to the industry's ultimate target of $5 per unit to make projects more feasible, according to Olejak, and they are still way above that level. "To be honest there are still no big tenders yet for NB-IoT," said Olejak during this week's LPWA World conference in London. "The module cost is still between €10 [$11.22] and €15 [$16.83] rather than the $5 we are looking at and so no customer is doing a serious commercial tender." T-Mobile's Magenta tariff claims to be the nation’s first NB-IoT plan, offering businesses rates of $6 a year per device for up to 12MB of data “for a limited time”, to connect to the network. The plan includes ten single packet transactions per hour at up to 64kb/s. T-Mobile said its Magenta plan is priced “at one tenth the cost of Verizon Cat-M plans”, while adding NB-IoT in general was “much more affordable” than Cat-M1. A pricing guideline on Verizon’s website shows it costs potential customers $2 per device for 200kB of data, or $3 per month per device for 500kB of data.